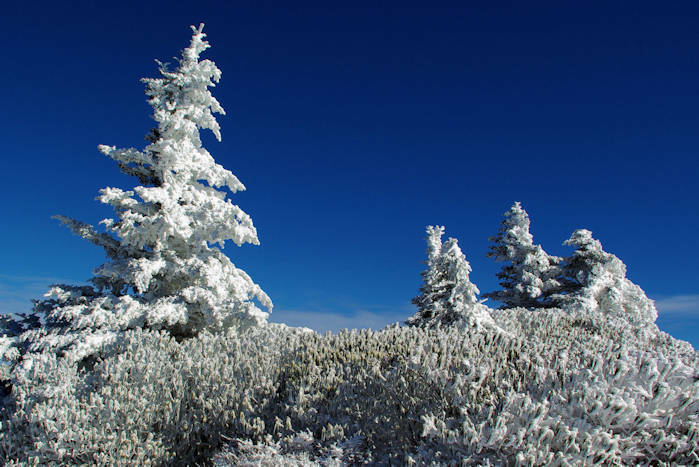 Take a photo tour of peaceful snow scenes from the Blue Ridge Parkway in the Asheville area of North Carolina. 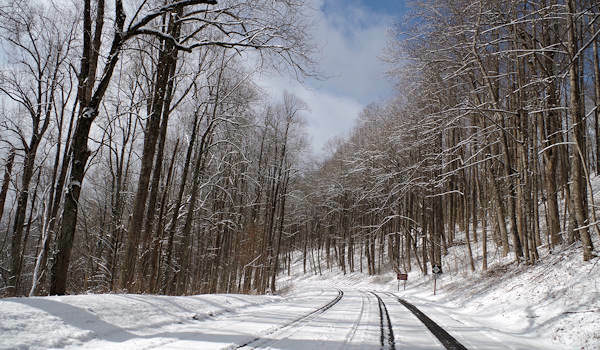 Since the Parkway is not plowed or treated during snows, it closes and creates a winter wonderland to explore by foot or cross country skiing. A few short sections stay open for local access, so you can take an adventureous drive there. 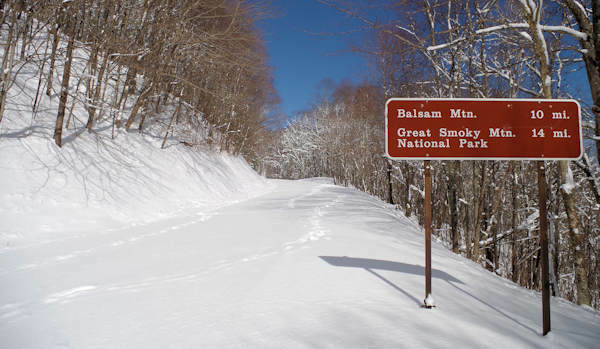 In the higher ridges north and south of Asheville, this scenic drive is closed much of the winter depending on the weather. 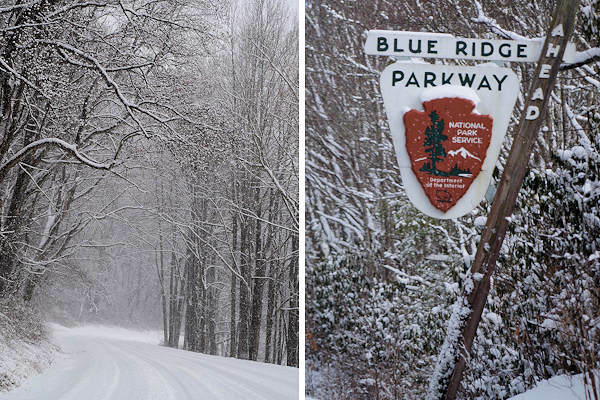 See our big Blue Ridge Parkway Guide to plan a trip in warmer months. Plus, see plenty of ideas for a winter getaway to Asheville. 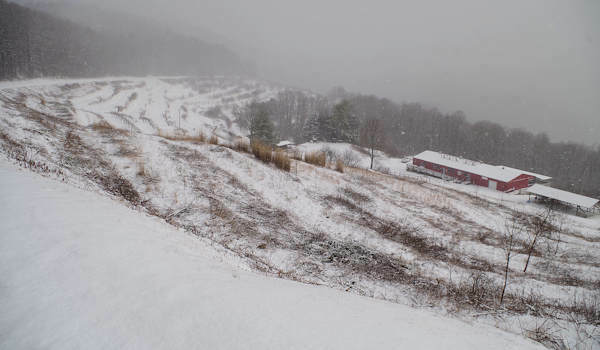 A fresh snow at Soco Gap (milepost 455.7, elevation 4570 feet), a great location to often see snow on the Parkway, located between Maggie Valley and Cherokee along US Highway 19. When the Parkway is closed, you can park at any cross roads and walk past gates. 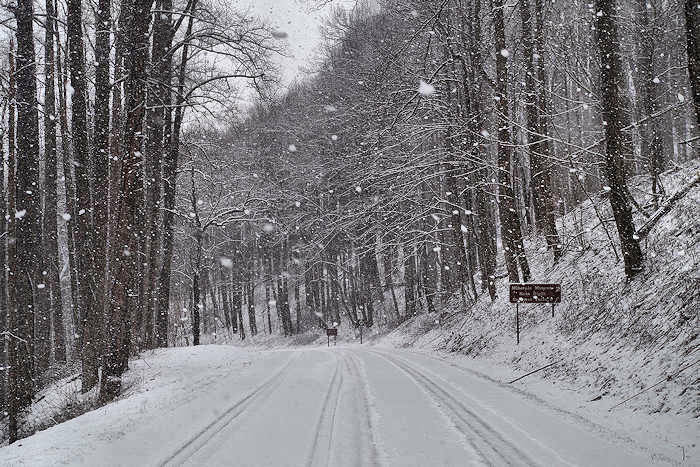 Often, you'll find snow scenes like this in the higher elevations of the Parkway while there is no snow in the city of Asheville and valley locations. The Orchard at Altapass covered in snow. This section oftens remains open for locals. A short growing season there is long enough to produce many apples to enjoy each fall. See our Orchard at Altapass Guide. 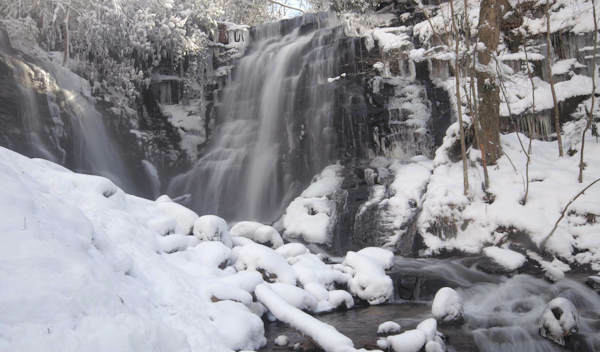 Just a couple of miles from the Blue Ridge Parkway is Soco Falls, a spectacular twin waterfall that is a short walk from the highway. 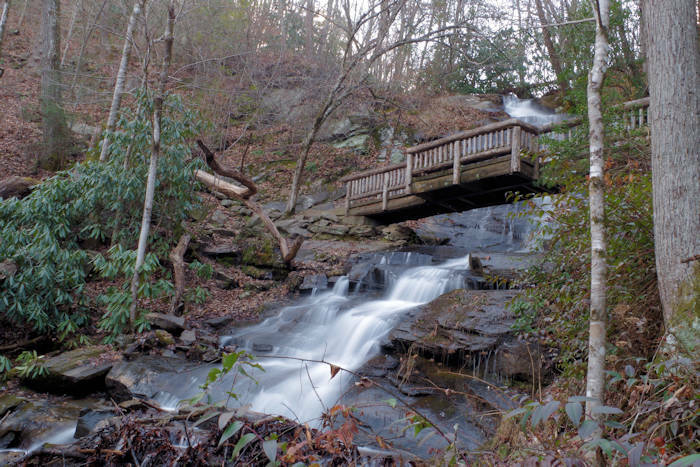 See our Soco Falls Guide. 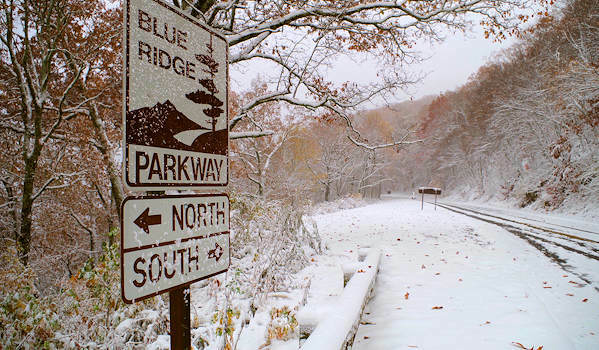 VIDEO: Take a drive with us on the Blue Ridge Parkway near Little Switzerland! Typical winter snow showers - pouring snow one minute and blue skies and sun the next! 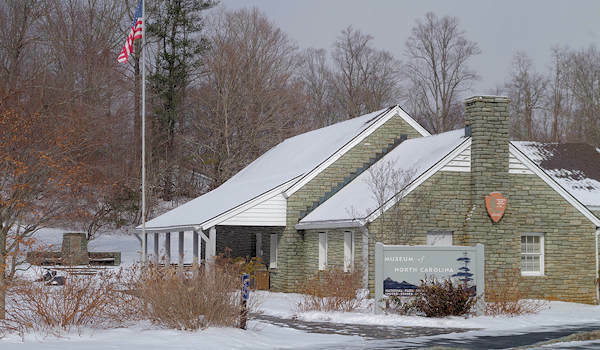 The Museum of North Carolina Minerals on the Blue Ridge Parkway near Spruce Pine. It's usually open seven days a week even when the Parkway is closed. Read more about it. An early snow covered the fall leaves, creating colorful contrasts along a walk on the Blue Ridge Parkway north of Asheville. 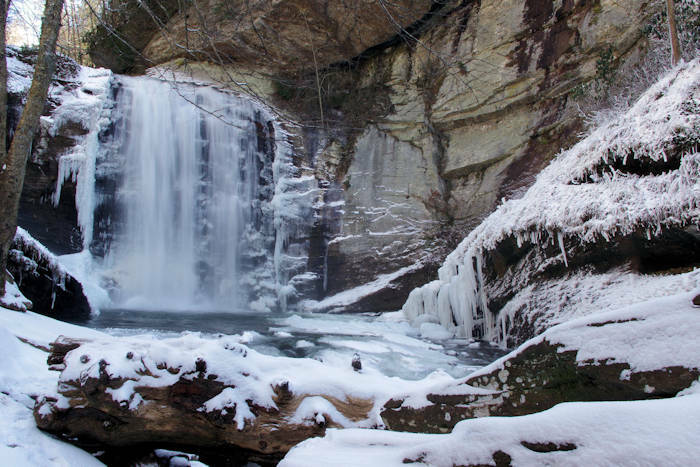 Read about a favorite Winter Hike on the Parkway. 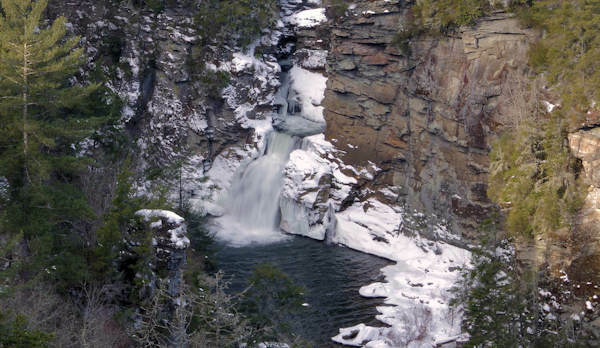 Hike to Linville Falls even if the Blue Ridge Parkway is closed. Park in the Pisgah National Forest for the Linville Gorge Wilderness area. Read much more. 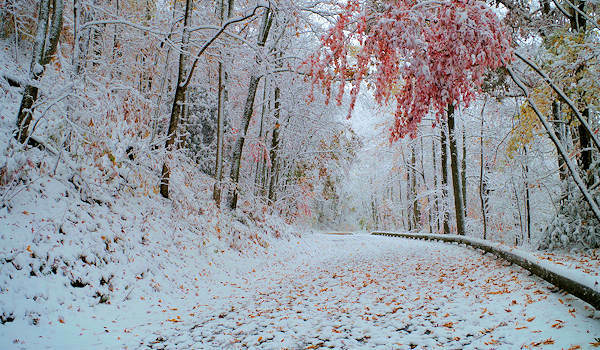 Every few years, we'll get an early November snow that blankets the fall colors along the Parkway. So instead of driving, you can walk through the wonderland.